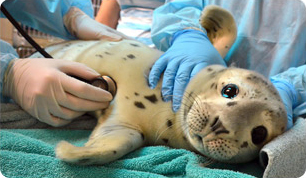 Founded in 1975, The Marine Mammal Center is an internationally renowned and state-of-the art marine mammal hospital that advances global conservation through marine mammal rescue and rehabilitation, scientific research, and education. Each year The Center treats 600 – 800 sick, injured and orphaned marine mammals with the goal of rehabilitation and release. The Center has a paid staff of 55 and a volunteer staff of ~1200 and collaborates with over 30 different scientific, educational, federal, state and non-profit organizations from around the world. The Veterinary Technician Team is currently recruiting applicants for our Veterinary Technician Internships. This position works with veterinary staff as well as the Center’s animal care volunteers to provide veterinary care for our patients, which consists of phocids, otariids, and the occasional cetaceans and sea otters. This position is unpaid and applicants are responsible for their own accommodations and transportation. Unfortunately, we are unable to host international applicants at this time. Main Hospital in Sausalito, CA with potential opportunities to work at our satellite facilities. The Veterinary Technician Internship is an exciting opportunity for students in a veterinary technician program and or licensed veterinary technicians who are interested in increasing their technical skills, gaining experience and knowledge as a technician in veterinary medicine, learning about the behavior, rescue and rehabilitation of marine mammals. Interns will be responsible for helping with the daily procedures of the hospital including helping to prepare, monitor, and expedite large amounts of exams and procedures that may require sedation or anesthesia. Interns will assist and work directly with the staff technicians on duty to ensure all the daily tasks and preparation for the next day are complete. Interns will be assigned to work on an animal care crew one day a week to gain husbandry experience. Duties on crew include, but are not limited to, animal handling, pen cleaning, medical charting, feeding, and medication preparation and administration. Other responsibilities include attending training classes, data entry, maintaining/restocking medical inventory, and assorted miscellaneous tasks. In addition, interns may also have the opportunity to work or shadow in other departments and to participate in marine mammal rescues, releases, and other field responses as available. Applicants must be in their second year or equivalent of a Veterinary Technician Program or be near completion of alternate track RVT program. Veterinary Technicians who are already licensed may be able to be accepted. Applicants must have worked a minimum of two months in a veterinary hospital. Preference will be given to students with prior work experience preferably in the veterinary field. Applicants should be able to demonstrate maturity and professional conduct at all times. Applicants must demonstrate excellent skills in communication, multi-tasking, be able to deal with ambiguity, and maintain composure under pressure. Applicants must be able to accept long hours and unpredictable schedules, including weekends. Applicants should possess practical computer knowledge with programs such as MS Word, Access, and Excel. The center is a teaching hospital, accommodating large numbers of students each year. Applicants must be able to work well in a team setting with people of different backgrounds and nationalities. While we stride to provide each student with as much learning opportunities as possible, individual experience will depend on case load and how many students we have on site. This internship position involves a fair amount of physical activity, such as: lifting, restraining and moving animals. Must be able to lift 50 pounds, be on your feet long hours and handle being outdoors in varying weather conditions. Applicants are required to pass a background check and a motor vehicle report prior to acceptance into the internship. Applicants must provide proof of liability insurance from their school. Students receiving university credit for their internship are responsible for making all arrangements with their educational institution. Students are responsible for informing their supervisor at the start of their internship of any skills they need to gain or any requirements, evaluations, or projects they need to be complete during the internship. Please note, that we reserve the right to terminate the internship at any time if needed. Due to the cyclic nature of our patients we only have Veterinary Technician Internships available from February through September. Each internship opportunity may vary slightly depending upon our patient load and what opportunities are available. During the internship students will be on their own trajectory, independent of any other students, depending upon their capabilities and experience. Each internship is a minimum of 8 weeks with a maximum of 12 weeks. Interns must be able to work 3-5 days a week, at least 24-40 hours per week. Work schedule must be flexible and may include evening shifts, weekends, and holidays. Based upon different technician program requirements. Exceptions may be made for internship length and hours per week, upon acceptance into the internship. Additional opportunities may include traveling down to our satellite facilities, Monterey Bay Operations in Moss Landing and San Luis Obispo Operations in Morro Bay. Interns may have the opportunity to work at both of our facilities as part of a 2-4day trip. (This opportunity would be set up based upon intern’s interest and ability to travel to these locations.) If interested, there is also the opportunity to work or shadow in our education department. Interested qualified applicants are encouraged to apply following the link below. Applicants will be required to submit the application along with a CV, resume, and two letters of recommendation, two references, and proof of medical insurance. Please note that one of the letters of recommendation must be from an instructor. Please click on the link below to apply. November 9, 2018 Week of November 26-30, 2018 December 5, 2018 Applications are closed.